2. Graduate School of East-West Medical Science, Kyung Hee University, Yongin 449-701, Republic of Korea. Though gallotannin was known to have anti-oxidant and antitumor activity, the underlying antitumor mechanism of gallotannin still remains unclear. Thus, in the present study, antitumor mechanism of gallotannin was elucidated in hepatocellular carcinoma cells. Gallotannin significantly exerted cytotoxicity against Hep G2 and Chang hepatocellular carcinoma cells with the accumulation of the sub-G1 population and increase of terminal deoxynucleotidyltransferasedUTP nick end labeling (TUNEL) positive cells as an apoptotic feature. Also, gallotannin attenuated the expression of pro-caspase9, pro-caspase3, Bcl2 and integrin β1 and cleaved poly(ADP)-ribose polymerase (PARP) in Hep G2 and Chang cancer cells. Furthermore, gallotannin suppressed cell repair motility by wound healing assay and also inhibited cell adhesion in Hep G2 cells. Of note, gallotannin attenuated the expression of epithelial cadherin (E-cadherin) to form cell-cell adhesion from the early stage, and also beta-catenin at late phase in Hep G2 cells. Consistently, Immunofluorescence assay showed that E-cadherin or β-catenin expression was suppressed in a time dependent manner by gallotannin. 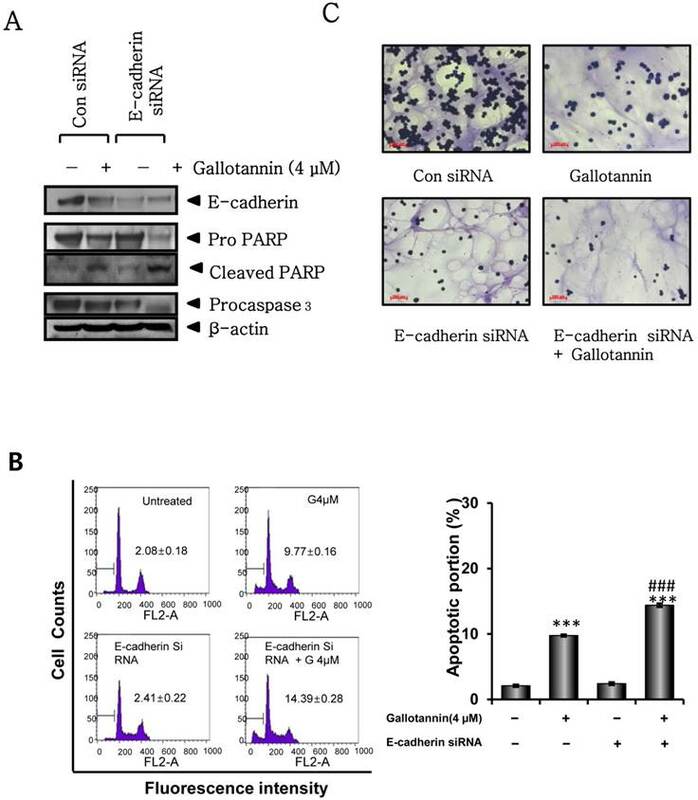 Furthermore, silencing of E-cadherin by siRNA transfection method enhanced PAPR cleavage, caspase 3 activation and sub G1 population and attenuated the cell adhesion induced by gallotannin in Hep G2 cells. Overall, our findings demonstrate that the disruption of cell adhesion junction by suppression of E-cadherin mediates gallotannin enhanced apoptosis in Hep G2 liver cancer cells. Keywords: gallotannin, Hep G2 cells, apoptosis, PARP, caspase, E-cadherin. Hepatocellular carcinoma (HCC) as the fifth most common primary malignancy is worldwide increasing incidence (1, 2). Though several anti-cancer drugs have been treated to the HCC patients, it still resulted in side effects such as recurrence and multidrug resistance (3). Recent studies suggest that the potentials of natural products or herbal medicines such as curcumin, resveratrol showed the anti-cancer activities to the HCC (4-8). Furthermore, some herbal composite formula such as Shi-Quan-Bu-Tang, or Xiao-Chai-Hu Tang were administrated to HCC patients (9, 10). Gallotannin, polyphenolic hydrolysable tannin found in green tea has shown in multiple biological roles in anti- inflammatory (11), anti-oxidative (12), and anti-bacterial functions (13). In addition, previous studies showed that gallotannin prevented nephrolithiasis via suppression of calcium oxalate crystal binding and oxalate induced oxidative stress in renal epithelial cells (14). Though gallatonnin showed the proapoptotic actions in colon cancer cells (15) and lung cancer cells A549 (16), underlying anti-cancer mechanism of gallotannin in hepatocellular carcinoma still remains unknown. E-cadherin which is located at the basolateral membrane in adherens junctions is a main marker of epithelial cell layers (17). Dysfunction of the adherens junction molecules such as E-cadherin and β-catenin play an important role in process of epithelial mesenchymal transition in development and tumorigenesis (17, 18). Mutation of E-cadherein was observed in highly invasive tumor cells line (19). Thus, in the current study, we for the first time investigated that gallotannin induced apoptosis via suppression of E-cadherin inhibiting invasive effects in Hep G2 hepatocellular carcinoma cells. Gallotannin (Figure 1A) was purchased from Sigma-Aldrich (Sigma-Aldrich, St.Louis, MO, U.S.A.). Human liver cancer cell lines, Chang and Hep G2 cells were obtained from American Type Culture Collection (ATCC). The cells were cultured in RPMI 1640 (Welgene, Daegu, Korea) supplemented with 10% fetal bovine serum (FBS) (Welgene, Daegu, Korea) and 1% antibiotics at 37°C in a humidified 5 % CO2 atmosphere. G2 or Chang cells at a density of 1×104 cells per well were incubated in the absence or presence of various concentrations of gallotannin for 48 h. For cell viability study, XTT (2,3-Bis-(2-Methoxy-4-Nitro-5-Sulfophenyl)-2H-Tetrazolium-5-Carboxanilide) (Sigma, USA) colorimetric assay was performed using XTT working solution prepared by mixing 1 mL of XTT stock solution (1 mg/mL in phosphate buffered saline (PBS)) with 10 μL of PMS (1.53 mg/mL in PBS). After 48 h treatment of gallotannin, a 50 μL of XTT working solution was added to each well and incubated at 37°C for 2 h. Then Microplate Reader (Sunrise, TECAN, Mannedorf, Switzerland) at 450 nm wavelength was used to measure the optical density (OD). To measure DNA content, Hep G2 or Chang cells in absence or presence of gallotannin for 48 h were fixed in 75% ethanol at -20°C. The Fixed cells were washed twice with PBS and resuspended in PBS containing RNase A (1 mg/mL). After 1 h incubation at 37°C, and the cells were stained with 400 μL of Propidium Iodide (PI) solution (50 μg/mL stock) at room temperature for 30 min in the dark. Stained cells were analyzed by flow cytometry using FACSCalibur flow cytometer (Becton Dickinson, FranklinLakes, NJ, U.S.A.). 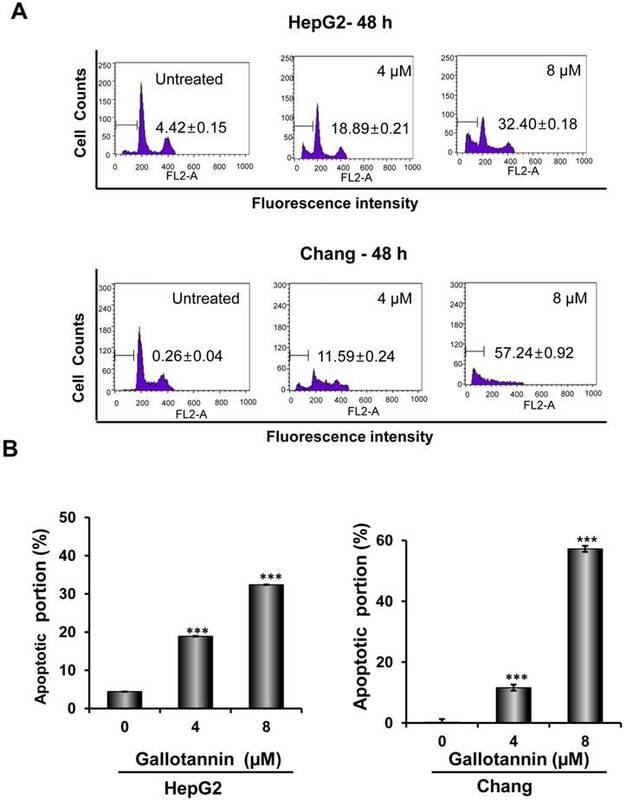 DNA fragmentation in Hep G2 cells exposed to gallotannin for 48 h was analyzed by using Dead EndTM fluorometric TUNEL assay kit (Promega, Madison, WI, USA). The tissues were fixed in 4% methanol-free formaldehyde solution in PBS for 35 minutes at 4°C and treated with terminal deoxyribonucleotidyltransferase (TdT) enzyme buffer containing fluorescein-12-dUTP for 1 hour at 37 °C in the dark. The slides were mounted with mounting medium containing PI (Propidium Iodide) (VECTOR, Burlingame, CA, USA) and visualized under an Axio vision 4.0 fluorescence microscope (Carl Zeiss Inc., Weimar, Germany). Total cell lysates from Hep G2 or Chang cells in the presence of gallotannin for 48 h were extracted using lysis buffer (50 mM Tris-HCl, pH 7.4, 150 mM NaCl, 1% Triton X-100, 0.1% sodium dodecyl sulfate (SDS), 1 mM ethylenediamineteraacetic acid (EDTA), 1 mM Na3VO4, 1 mM NaF, protease inhibitor cocktail). The proteins were separated on 4-12% Bis-Tris gels and electro-transferred onto a Hybond ECL transfer Membrane (GE Healthcare Bio-Science, Piscataway, NJ, U.S.A.). The membranes were blocked with 5% nonfat dry milk and immunoblotted with antibodies such as pro-caspase-3, PARP, pro-caspase-9, Bcl-2, E-cadherin, beta catenin, integrin β1 and beta actin (Cell signaling). Horseradish peroxidase-conjugated secondary anti-mouse or rabbit antibodies (AbD serotec, Kidlington, UK) were incubated. The protein expression was visualized by enhanced chemiluminescence (ECL) systems (Amersham Pharmacia, Piscataway, NJ). To measure the migratory ability of Hep G2 cells, a wound-healing assay was carried out. The confluent cells in the absence or presence of gallotannin were scratched with a 200 μL pipet tip, followed by washing with PBS. One day later, Hep G2 cells were fixed and stained with Diff-Quick, and photographed under a fluorescence microscope (AXIO observer A1, Zeiss, Germany). The number of migrated cells into the scratched area was counted. Hep G2 cells at 5 × 104 cells per well pre-incubated in the presence of gallotannin (4 μM) for 20 min at 37 °C were seeded in a Matrigel coated plate for 10 min at 37 °C. After washing with PBS to remove unattached cells, attached cells were fixed in 1% glutaraldehyde in PBS for 20 min followed by staining with 0.02% crystal violet solution for 5 min at room temperature. Randomly chosen fields were photographed under a fluorescence microscope (AXIO observer A1, Zeiss). The attached cells were calculated for cell-cell adhesion percentage. Small interfering RNA (siRNAs) for E-cadherin (Bioneer, Daejun, South Korea) or control vector (80 nM) was transfected using INTERFERin® reagent (Polyplus, IIIkirch, France) in Hep G2 cells. One day after transfection, gallotannin (4μM) was treated in Hep G2 cells for 48 h.
To statistical analysis of the data, Sigmaplot version 12 software (Systat Software Inc., San Jose, CA, U.S.A.) was used. All data were presented as means ± standard deviation (S.D.). Statistical significance between control and gallotannin-treated groups was analyzed using the Student's t-test. Cytotoxicity of gallotannin in human liver cancer cell lines, Hep G2 and Chang cells was evaluated by XTT assay. After various concentrations (0, 2, 4, 8, 16 μM) of gallotannin were treated in Hep G2 and Chang cells for 48 h, cell viability was determined. As shown in Figure 1 B, gallotannin showed significant cytotoxicity in Hep G2 and Chang cells after 48 h culture. We also confirmed the apoptotic bodies like cell shrinkage in gallotannin treated Hep G2 and Chang cells under an inverted microscope (Figure 1C and D). Gallotannin exerted the cytotoxicity against Hep G2 and Chang hepatocellular carcinoma cells. (A) Structure of gallotannin. (B) Cytotoxicity of gallotannin in Hep G2. Hep G2 cells were treated with various concentrations of gallotannin (0, 2, 4, 8, or 16 μM) for 48 h and XTT assay was used.to find out cytotoxicity and apoptotic morphological changes in gallotannin treated Hep G2 (C) or Chang (D) cells under inverted microscopy at ×200 magnification. In order to confirm whether the cytotoxicity of gallotannin in Hep G2 or Chang cells was due to apoptosis induction, cell cycle analysis using flow cytometry with PI staining was performed. 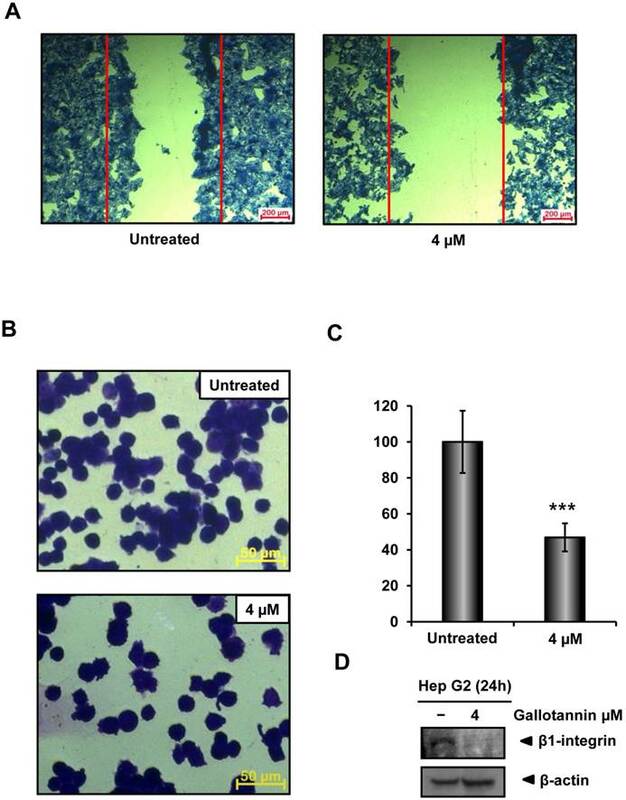 As shown in Figure 2 A and B, gallotannin significantly increased the accumulation of sub-G1 apoptotic portion in a dose-dependent manner in Hep G2 and Chang cells compared to untreated control. Consistently, Western blotting revealed that gallotannin cleaved PARP and attenuated the expression of pro-caspase 9/3, Bcl2 and integrin β1 in a dose dependent manner in Hep G2 or Chang cells (Figure 2C). Also, we confirmed that gallotannin induced apoptosis in Hep G2 or Chang cells by TUNEL assay (Figure 2D). Gallotannin increased sub-G1 population and regulated apoptotic genes in Hep G2 and Chang cells. 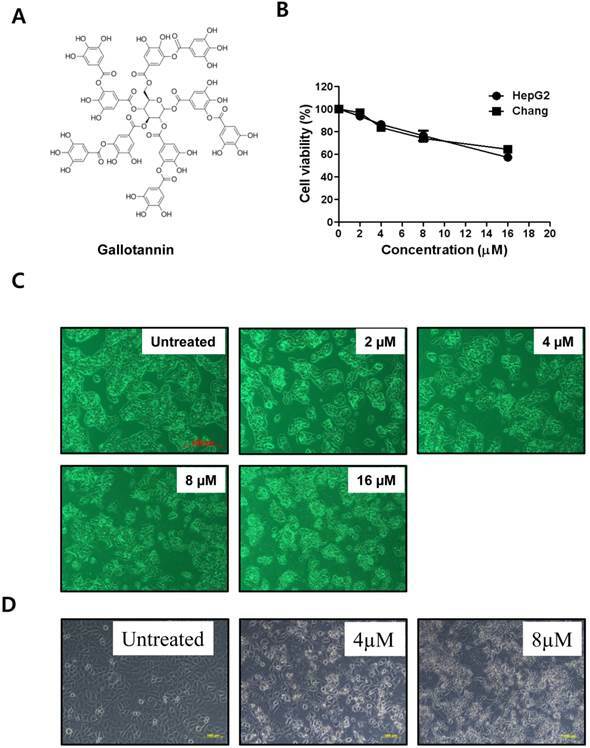 (A) Effect of gallotannin on sub G1 population by FACS analysis with propidium iodide (PI) staining. Hep G2 and Chang cells were treated with various concentrations of gallotannin (0, 4, 8 μM) for 48 h and stained with PI using Flow cytometry. (B) Bar graphs for sub-G1 population in Hep G2 and Chang cells. ***, p < 0.001, vs untreated control. (C) Effect of gallotannin on apoptotic proteins in Hep G2 and Chang cells. Cell lysates from gallatonnin treated Hep G2 and Chang cells were subjected for western blotting for PARP, pro-caspase 9 and 3, Bcl2 and β-Actin. (D) Apoptotic cells were detected by TUNEL assay. Cells in the absence or presence of gallotannin were stained with TUNEL-FITC (Green) and PI (Red). Data represent means ± S.D. In order to check the migratory and adhesive ability of gallotannin in Hep G2 cells, wound healing and adhesion assay were carried out. As shown in Figure 3A, gallotannin at 4 μΜ significantly decreased the migration of Hep G2 cells compared to untreated control. Furthermore, treatment of gallotannin (4 μΜ) resulted in significant reduction of cell adhesion to Matrigel coated plate compared to untreated control (Figure 3 B,C). Integrin β1 which is well characterized as a cell adhesion receptor was downregulated in gallotannin treated Hep G2 cells (Figure 3D). Gallotannin suppressed the migration and adhesion of Hep G2 cells. (A) Effect of gallotannin on the migration of Hep G2 cells by wound healing assay. Confluent cells were scratched and then treated with gallotannin in a complete medium for 24 h. The number of cells migrated into the scratched area was photographed (×100). (B) Effect of gallotannin on the adhesion to Matrigel coated plate after 20 min exposure. Attached cells were photographed (×200) after crystal violet staining (C) Quantification of attached cells. Scale bar = 100 μm. ***, p < 0.001, vs untreated control. (D) Western blotting was performed with antibody of integrin β1 in Hep G2 cells exposed to gallotannin for 24 h.
There are evidences for the role of E-cadherin in apoptosis in cancer cells (20-23). In this regards, we examined the role of E-cadherin in gallotannin induced apoptosis in Hep G2 cells. As shown in Figure 4 A, gallotannin attenuated the expression of E-cadherin in a time dependent manner from 24 h after treatment, while the expression of beta catenin was effectively reduced in Hep G2 cells only at 72 h after treatment (Figure 4 A, B). We also confirmed that red color expression for E-cadherin around cell membrane or β-catenin was effectively attenuated in gallotannin treated Hep G2 cells compared to untreated control by immunofluorescence assay (Figure 4C or D). Gallotannin attenuated the expression of E-cadherin, and beta-catenin in Hep G2 cells. (A) Effect of gallotannin on E-cadherin in Hep G2 cells in a concentration (0, 2, 4 μM) and time dependent manner (24, 48 or 72 h) by Western blotting (B) Effect of gallotannin on E-cadherin and beta-catenin in Hep G2 cells in time courses (0, 6, 18, 24, 48 h) by Western blotting. Effect of gallotannin on E-cadherin (C) or β-catenin (D) localization in Hep G2 cells in Hep G2 cells by Immunofluorescence assay. Hep G2 cells in the absence or presence of gallotannin (4μM) were fixed and immunostained with α-E-cadherin antibody. Nuclei were stained with DAPI. Scale bar, 40 μm. Next, we investigated whether E-cadherin mediates apoptosis in gallotannin treated Hep G2 cells by using siRNA transfection of E-cadherin. 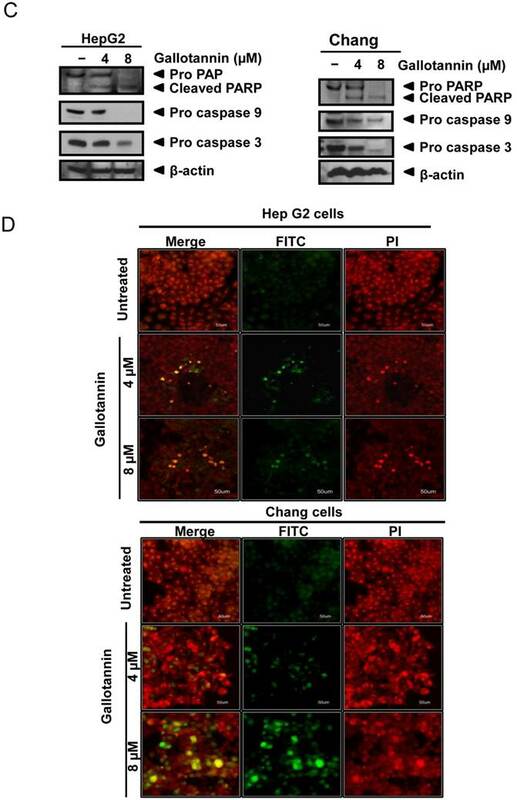 Twenty four hours after transfection with control or E-cadherin siRNA, gallotannin was treated in Hep G2 cells for 48 h. As shown in Figure 5A, silencing of E-cadherin enhanced PARP cleavage and caspase 3 activation induced by gallotannin in Hep G2 cells by Western blotting. Consistently, FACS analysis showed that silencing of E-cadherin promoted the accumulation of sub G1 contents induced by gallotannin in Hep G2cells (Figure 5 B). Also, combination of silencing of E-cadherin and gallotannin treatment synergistically inhibited cell adhesion better than E-cadherin siRNA or gallotannin alone treated group (Figure 5C). Silencing of E-cadherin enhanced apoptosis and sub G1 population induced by gallotannin in Hep G2 cells. One day after transfection with control vector or E-cadherin siRNA plasmid, gallotannin (4 μM) was treated in Hep G2 cells for 48 h. (A) Effect of gallotannin on E-cadherin, PARP and pro-caspase 3 in Hep G2 cells transfected by control vector or E-cadherin siRNA plasmid. (B) Effect of gallotannin on sub G1 population in Hep G2 cells transfected by control vector or E-cadherin siRNA plasmid by FACS analysis. Bar graphs showing the percentages of sub-G1 DNA contents undergoing apoptosis. (C) Effect of gallotannin on the adhesion to Matrigel coated plate in Hep G2 cells transfected by control vector or E-cadherin siRNA plasmid ***, p < 0.001, vs untreated control. ###, p < 0.001, vs gallotannin treated group. Polyphenolic compounds such as ellagitannins (24), and oligomeric proanthocyanidins (25) induced apoptosis and inhibited the growth of several human cancer cells. Furthermore, pentagalloyl glucose (PGG) which is the precursor of gallotannin has been shown to induce cell cycle arrest and apoptosis (26, 27), and suppress angiogenesis and tumor growth in vivo (28). Gallotannin, a water soluble polyphenol, was known to have antitumor activity in several cancers such in colon (15, 29), lung (16) and breast (30). Al-Ayyoubi et al reported that gallotannin inhibited the growth of HCT-116 colon cancer cells and also induced apoptosis in HCT-116 p53 (+/+) cells (15). Yu et al suggested that gallotannin induced apoptosis in A549 lung cancer cells via phosphorylation of Akt and p38 signaling and induction of COX-2(16). Nevertheless, the underlying antitumor mechanism of gallotannin was not fully understood until now. Thus, in the current study, antitumor mechanism of gallotannin was elucidated in Hep G2 and Chang hepatocellular carcinoma cells. Gallotannin showed significant cytotoxicity in Hep G2 and Chang cells and also significantly increased sub-G1 population, implying the cytotoxicity of gallotannin was exerted by apoptosis induction. In general, apoptosis is induced via two distinct pathway such as the extrinsic death receptor pathway and intrinsic mitochondrial pathway (31, 32). Gallotannin attenuated the expression of procaspase9, pro-caspase 3, Bcl2 and integrin β1 and increased the cleavages of poly (ADP)-ribose polymerase (PARP) in Hep G2 carcinoma cells, indicating mitochondrial dependent apoptosis by gallotannin after 48 h exposure in Hep G2 hepatocellular carcinoma cells. 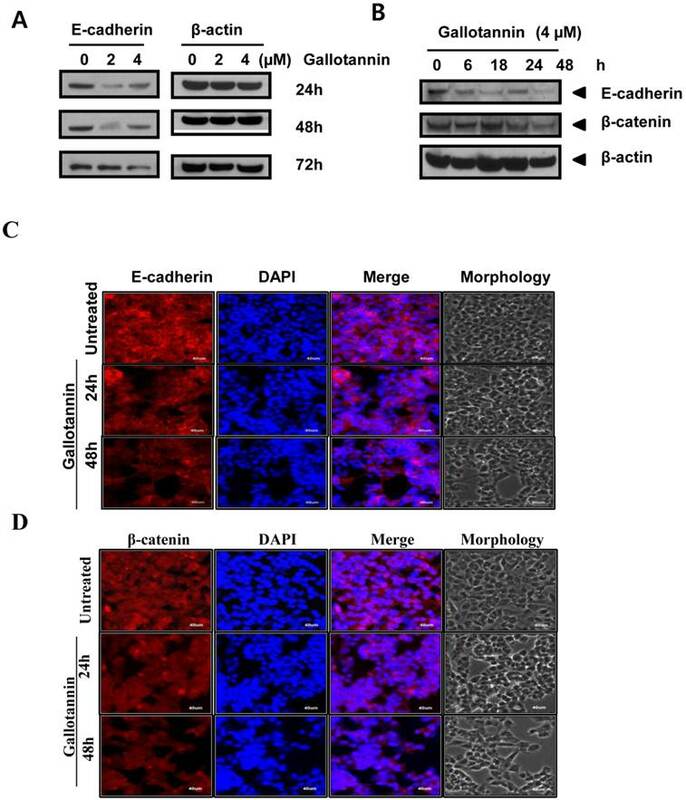 Cadherins, calcium dependent cell-cell adhesion molecules to coordinate morphogenetic cell movement, mainly consist of epithelial cadherin (E-cadherin), placental cadherin (P-cadherin) and neuronal cadherin (E-cadherin) (33, 34). Here, gallotannin attenuated the expression of E-cadherin to form cell-cell adhesion from the early stage, and also beta-catenin to form cell-cell adhesion complex with E-cadherin at late phase in Hep G2 cells, implying gallotannin can regulate cell-cell adhesion complex of E-cadherin and beta catenin. There are evidences that cell adhesion involvement in tumorigenesis and invasion focused on E-cadherin, given that this molecule is the major cadherin involved in epithelial cell-cell adhesion, and the majority of cancers originate from epithelial cells (35, 36). Wound healing assay revealed gallotannin suppressed cell repair motility after 24 h expoure and also adhesion assay showed gallotannin inhibited cell adhesion to Matrigel coated plate at nontoxic concentrations only after 20 min exposure in Hep G2 cells, implying the inhibitory effect of gallotannin on migration and adhesion to extracellular matrix in epithelium. Consistently, Immunofluorescence assay confirmed that red color E-cadherin expression around membrane was reduced compared to untreated control in Hep G2 cells. There are previous evidences that E-cadherin is involved in adhesion and apoptosis. Loss of cell to cell contact resulted in anoikis which is a specific apoptotic process (37) and loss of E-cadherin and beta catenin led to an early trigger of apoptosis (22, 23). Also, E-cadherin known as a substrate for caspase 3 (20), prevented the apoptosis in immmortalized granuloma cells (38) and suppressed the anoikis in Ewing sarcoma cells (21). Several studies suggest that degradation of E-cadherin and beta-catenin is processed by the lysosome and the proteasome upon junction disorganization (39) and caspases upon apoptosis (40, 41). Similarly, in the current study, silencing of E-cadherin representing loss of E-cadherin enhanced PARP cleavage and caspase 3 activation as well as the accumulation of sub G1 contents induced by gallotannin in Hep G2 cells, demonstrating the loss of E-cadherin initiates apoptosis induction at early stage in Hep G2 cells. Nonetheless, the exact molecular mechanism by which silencing of E-cadherin enhances gallatonnin induced apoptosis as an indirect initiator of apoptosis still remains unclear. Thus, further study is requested to elucidate the exact role of E-cadherin in apoptosis induction in vitro and in vivo in the future. Overall, our findings demonstrate that gallotannin enhanced apoptosis in Hep G2 hepatocellular cancer cells partly via the disruption of cell adhesion junction by suppression of E-cadherin as a potent chemopreventive agent for liver cancer treatment and prevention. This work was supported by the National Research Foundation of Korea (NRF) grant funded by the Korea government (MSIP) (No. 2007-0054931). Corresponding author: Sung-Hoon Kim, O.M.D., Ph.D., Cancer Preventive Material Development Research Center, College of Oriental Medicine, Kyung Hee University, 1 Hoegi-dong, Dongdaemun-gu, Seoul 131-701, South Korea. Tel: 82-2-961-9233; Fax: 82-2-964-1064; E-mail: sungkim7ac.kr.